WB: MCF7, HeLa, HEK-293T and Jurkat whole cell lysate (ab7899). IHC-P: Human lung carcinoma tissue. IP: HeLa whole cell lysate (ab150035). ab10485 was affinity purified using the peptide immobilized on solid support. Our Abpromise guarantee covers the use of ab10485 in the following tested applications. WB 1/5000 - 1/25000. 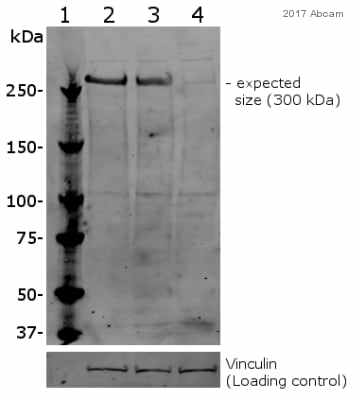 Can be blocked with KAT3B / p300 peptide (ab4914). Functions as histone acetyltransferase and regulates transcription via chromatin remodeling. Acetylates all four core histones in nucleosomes. Histone acetylation gives an epigenetic tag for transcriptional activation. Mediates cAMP-gene regulation by binding specifically to phosphorylated CREB protein. Mediates acetylation of histone H3 at 'Lys-122' (H3K122ac), a modification that localizes at the surface of the histone octamer and stimulates transcription, possibly by promoting nucleosome instability. Mediates acetylation of histone H3 at 'Lys-27' (H3K27ac). Also functions as acetyltransferase for nonhistone targets. Acetylates 'Lys-131' of ALX1 and acts as its coactivator. Acetylates SIRT2 and is proposed to indirectly increase the transcriptional activity of TP53 through acetylation and subsequent attenuation of SIRT2 deacetylase function. Acetylates HDAC1 leading to its inactivation and modulation of transcription. Acts as a TFAP2A-mediated transcriptional coactivator in presence of CITED2. Plays a role as a coactivator of NEUROD1-dependent transcription of the secretin and p21 genes and controls terminal differentiation of cells in the intestinal epithelium. Promotes cardiac myocyte enlargement. Can also mediate transcriptional repression. Binds to and may be involved in the transforming capacity of the adenovirus E1A protein. In case of HIV-1 infection, it is recruited by the viral protein Tat. Regulates Tat's transactivating activity and may help inducing chromatin remodeling of proviral genes. Acetylates FOXO1 and enhances its transcriptional activity. Acetylates BCL6 wich disrupts its ability to recruit histone deacetylases and hinders its transcriptional repressor activity. Participates in CLOCK or NPAS2-regulated rhythmic gene transcription; exhibits a circadian association with CLOCK or NPAS2, correlating with increase in PER1/2 mRNA and histone H3 acetylation on the PER1/2 promoter. Acetylates MTA1 at 'Lys-626' which is essential for its transcriptional coactivator activity (PubMed:10733570, PubMed:11430825, PubMed:11701890, PubMed:12402037, PubMed:12586840, PubMed:12929931, PubMed:14645221, PubMed:15186775, PubMed:15890677, PubMed:16617102, PubMed:16762839, PubMed:18722353, PubMed:18995842, PubMed:23415232, PubMed:23911289, PubMed:23934153, PubMed:8945521). Acetylates XBP1 isoform 2; acetylation increases protein stability of XBP1 isoform 2 and enhances its transcriptional activity (PubMed:20955178). Acetylates PCNA; acetylation promotes removal of chromatin-bound PCNA and its degradation during nucleotide excision repair (NER) (PubMed:24939902). Acetylates MEF2D. Defects in EP300 may play a role in epithelial cancer. Chromosomal aberrations involving EP300 may be a cause of acute myeloid leukemias. Translocation t(8;22)(p11;q13) with KAT6A. Contains 1 CBP/p300-type HAT (histone acetyltransferase) domain. The CRD1 domain (cell cycle regulatory domain 1) mediates transcriptional repression of a subset of p300 responsive genes; it can be de-repressed by CDKN1A/p21WAF1 at least at some promoters. It conatins sumoylation and acetylation sites and the same lysine residues may be targeted for the respective modifications. It is proposed that deacetylation by SIRT1 allows sumoylation leading to suppressed activity. Acetylated on Lys at up to 17 positions by intermolecular autocatalysis. Deacetylated in the transcriptional repression domain (CRD1) by SIRT1, preferentially at Lys-1020. Deacetylated by SIRT2, preferentially at Lys-418, Lys-423, Lys-1542, Lys-1546, Lys-1549, Lys-1699, Lys-1704 and Lys-1707. Citrullinated at Arg-2142 by PADI4, which impairs methylation by CARM1 and promotes interaction with NCOA2/GRIP1. Methylated at Arg-580 and Arg-604 in the KIX domain by CARM1, which blocks association with CREB, inhibits CREB signaling and activates apoptotic response. Also methylated at Arg-2142 by CARM1, which impairs interaction with NCOA2/GRIP1. Sumoylated; sumoylation in the transcriptional repression domain (CRD1) mediates transcriptional repression. Desumoylated by SENP3 through the removal of SUMO2 and SUMO3. Probable target of ubiquitination by FBXO3, leading to rapid proteasome-dependent degradation. Phosphorylated by HIPK2 in a RUNX1-dependent manner. This phosphorylation that activates EP300 happens when RUNX1 is associated with DNA and CBFB. Phosphorylated by ROCK2 and this enhances its activity. Phosphorylation at Ser-89 by AMPK reduces interaction with nuclear receptors, such as PPARG. Cytoplasm. Nucleus. In the presence of ALX1 relocalizes from the cytoplasm to the nucleus. Colocalizes with ROCK2 in the nucleus. Immunohistochemistry (Formalin/PFA-fixed paraffin-embedded sections) analysis of human lung carcinoma tissue labeling KAT3B / p300 with ab10485 at 1/1000 (1 µg/ml). Detection: DAB. ab10485 detecting p300 in HeLa (human epithelial cell line from cervix adenocarcinoma) cells by Immunoprecipitation . For the immunoprecipitation experiment (right-hand panel), ab10485 was used at a concentration of 20 µg/10 mg of HeLa whole cell lysate (lanes correspond to 5, 15 and 50 µg of lysate). The flow-through was analysed by WB using ab10485 at a concentration of 0.04 µg/ml. The identity of the band marked as "p300" was also confirmed using mass spectrometry. Lysates/proteins at 38 µg per lane. Publishing research using ab10485? Please let us know so that we can cite the reference in this datasheet.